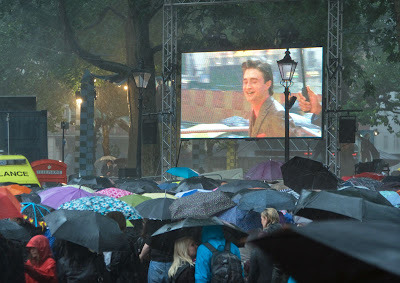 Last night hundreds of Harry Potter fans braved the rain, hail and thunder to catch a glimpse of the stars at the premiere of the half-Blood Prince in Leicester Square. It must be a good idea because there is so many people. so did you ! Very good shot ! Hope you didn't get too wet!!! All those umbrellas dripping down necks. And.... that poor pady on the fourth Plinth when the heavens opened... all she had was a plastic bag with her... miserable ! Hope you didn't get too wet. Did you see HP ? Now these ARE fans! A sea of umbrellas! and the colors of the umbrellas made for some great colors though.. Rain drops keep fallin' on my head! Fun and wet photo! Harry Potter fans have always amazed me! Fabulous capture! Love the color of all the "bumbershoots." My soon-to-be 21 year old is eagerly awaiting the newest Harry Potter film (we saw the last one when it was raining like mad in Dublin two years ago). Awesome! I saw the last one there at the mid night showing a few days after the actual premiere. It was very cool! This is a very impressive shot given the conditions! I love all the umbrellas and I know Leicester Square so well I can almost feel like I was there too! I'm so impressed by the consistent great quality and interest of your pictures. Are you a pro photographer? If not, you should be! The photo was worth it, but was it really worth getting soaked?! Wow, I have never seen so many umbrellas in one place! Amazing. I wish I could have been there! Man, oh man would I have love to have been there! I've got my HBP premiere shirt ready and waiting for the midnight showing in Chicago! I'm excited! All those umbrella's and a Grey London! Such a great idea for a photo! Nice contrast: umbreallas, lights and the big screen! Weere you really there in that chaos? Ciao. A.
obviously the Potter magic wasn't working tonight. Now that I found your blog I can stop following the other London Daily Photo by some guy who is never there when something happens. I mean a blog like this should not only be about lamp post or buildings but on life & going on. I'm switching to your blog. What a wonderful shot! How dedicated Harry Potter fans are... wait - I'm a Harry Potter fan! Good on them! As my mother used to say: Go out in the rain, it`s okay, you`re not made of sugar, you know!